Founded on August 25, 1916, the National Park Service has protected America's soaring mountain ranges, verdant forests, and sprawling deserts for an entire century. Full of natural wonders and rare wildlife, the National Parks offer a respite from civilization, serving as a backyard for all of America. In honor of 100 years of stewardship of America's most precious natural monuments here are 9 fascinating facts about the National Parks. 1. They cover 3.4 percent of the United States. Spanning 27 states, America's 58 National Parks blanket an amazing 84.6 million acres of American soil. That's a full 3.4 percent of the United States. The largest, St. Elias National Park, takes up a vast 8.3 million acres in South Central Alaska. But not all of the National Parks are so massive. In fact, the smallest, Hot Springs in Arkansas, covers a mere 5500 acres. Sequoia National Park in California is home to General Sherman, the largest known tree in the world. While General Sherman isn't the tallest or the oldest tree on Earth, at 52,500 cubic feet in volume, it is the largest. To put its size in perspective, an Olympic sized swimming pool has a volume of 88,500 cubic feet-that means General Sherman is a little over half the size of a swimming pool. At a mere 2000 years old, however, it's just reaching middle age. Scientists say it's still growing. 3. ...and Mammoth Cave National Park has the longest known cave system in the world. 4. You can sled down the tallest sand dune in North America. In Colorado's Great Sand Dunes National Park, visitors can not only view the highest sand dune in North America, they can sled down it. Called the Star Dune, the giant 755-foot dune is perfect for adrenaline junkies with a need for speed. Great Sand Dunes National Park allows visitors to race down all its dunes on custom made sand boards and sleds. 5. Yellowstone has its own flower. Along the shores of Yellowstone Lake in Wyoming's Yellowstone National Park, a flower grows that can't be found anywhere else on Earth. The Yellowstone sand verbena (Abronia ammophila) grows on a mere 1.48 acres of the park. Its presence in Yellowstone is surprising not only for its uniqueness, but because other types of verbena usually grow in much warmer climates. 6. Hot Springs National Park started out as a spa. 7. Dry Tortugas is the most remote national park. Seventy miles from Key West, Florida, Dry Tortugas National Park can only be reached by boat or airplane. Most of the 100-square-mile park is open water, though it also encompasses seven tiny islands. Known for its amazing scuba diving and snorkeling, the park features hundreds of shipwrecks visitors can explore. It's also home to five species of sea turtle. 8. Mesa Verde National Park protects 5000 archaeological sites. 9. 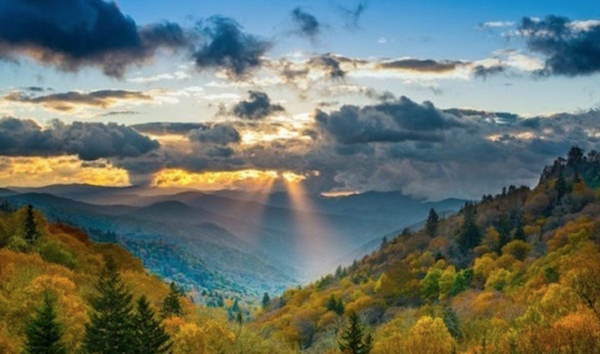 The most visited park is Great Smoky Mountains. While all of the National Parks are full of breathtaking views and amazing historical monuments, Great Smoky Mountains National Park seems to be the most popular. Last year, it had more guests than any other park, attracting 307.2 million visits.